The North American International Motor Show today marks the world premiere of the new Lexus RX300. The new car will make its European debut at the Geneva Motor Show in March 2003. Mr Yukihiro Okane, chief engineer of the next generation RX says: "We determined at the outset that the new RX must have advanced styling, an unsurpassed level of safety equipment and a host of innovative features. Parallel to this, we chose to improve driving dynamics in several areas and the passengers will be rewarded with an even higher level of sophistication." The new Lexus RX is distinguished from its predecessor by bold new looks, which combine the most advanced elements of SUV styling with a sporting and dynamic image. The RX shares styling cues with other Lexus models, in particular its distinctive ‘C-post’ rear pillar design. The front grille and headlights reinforce this family feel and continue the identity of the current model. The modern and distinctive shape intelligently disguises the fact that it is bigger and roomier than most of its segment rivals. At 4730mm in length, the new Lexus RX is 155mm longer than its predecessor and 25mm wider, with a 100mm longer wheelbase for additional passenger and luggage room. The new RX has added engaging dynamics to the expected Lexus refinement in any circumstance. This is aided by the exceptional rigidity of the new body structure, while an improved front MacPherson strut suspension system includes a new coil spring design, which gives greater lateral force control, allowing better control and a smoother ride. Revised suspension bushes complement an upgraded power steering system, to create a linear vehicle movement during initial steering input, resulting in improved cornering and steering response. At the rear, a dual-link strut suspension system is used in combination with a new, more rigid rear axle design. Parallel to this, coils and shock absorbers feature a new layout, engineered to achieve a flatter ride. Both front and rear suspension systems are further complemented by ‘high reaction’ shock absorber developments to achieve high response and high damping force at small amplitudes. In addition, a new 4-wheel air suspension will be available that offers a still higher level of performance and refinement. This optional feature provides greater ride control together with an auto-levelling function, plus three additional modes to alter ride height through a range of 60mm. Stylish five-spoke 18-inch alloy wheels will be available fitted with 235/55R18 high performance tyres, enhancing driver feedback and cornering performance. Larger 319mm front brake discs are now used, while an increase in front brake piston size and reduction of brake pedal stroke ensures more linear and powerful braking performance. The European version of the new RX300 uses a development of the transversely mounted high-performance 3-litre V6 engine of the original model. Power is increased from 201bhp to 204bhp by refinement of the intake and exhaust systems. A combination of these engine refinements with a more aerodynamic body and higher-performance tyres increases the top speed from 112mph to 124mph. A new five-speed automatic transmission is used for the first time. In addition to offering additional driver appeal with a sequential manual gearchange, combined fuel economy is also improved as a result; from 21.7mpg for the original RX300, to 22.4mpg for the new model. 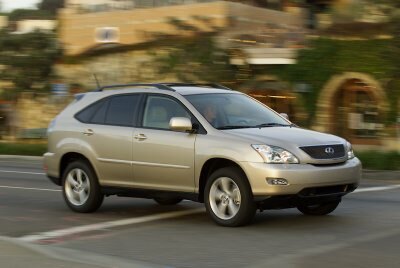 Thanks to this, the new Lexus RX300 also complies with EURO IV emission regulations. The new gearbox is combined with a new drivetrain in which the torque distribution between the front and rear wheels is electronically controlled by the Traction Control (TRC), rather than the previous mechanical control by a viscous limited-slip differential. The new TRC system provides more precise control, providing smooth traction even when the throttle pedal is used roughly. "The new interior design must have originality and attractions suitable for the new breed of SUV buyer," says Mr Okane. "The interior concept reflects the dynamic style of the exterior." As well as the customary standards of Lexus comfort, ambience, practicality and luxury, the RX combines the latest contemporary design with the highest quality materials. The interior design is sporty but spacious, solid but luxurious, in a light and roomy cabin trimmed with a choice of three colours which match the ivory, black or light grey leather seats. The main instrument cluster in front of the driver is housed in a distinctive three-pod design with a central speedometer, flanked by tachometer and a multi-function display. The dashboard features a distinctive brushed metal surround on each side of the centre console, containing the 7-inch screen for the optional Lexus Navigator, climate and audio controls. An 11-speaker premium audio system will also be available based on Lexus’ unique collaboration with the world’s most exclusive maker of home audio systems, Mark Levinson. The central ‘cool metal’ trim is complemented by curved light wood in the lower console containing the selector lever for the sequential automatic transmission, and as highlights on the steering wheel, door trims and on the centre console box between the front seats. The adjustable console box can either slide forward to give a feeling of continuity with the centre console, or backwards to allow a ‘walkthrough’ between the front seats. The new Lexus RX offers a wealth of features to set new standards in both active and passive safety. Uppermost are the excellent driving dynamics, aided still further by Vehicle Stability Control, Traction Control and Brake Assist technology, but additionally the new RX carries more safety equipment than any other vehicle in its segment. AFS, Adaptive Front-lighting System, is one of the several safety features available in the new Lexus RX. For the first time in an SUV, AFS uses an electronic controller to calculate from the vehicle speed and steering angle, the optimum swivel of the lighting area for better visibility while cornering. Unlike earlier systems which were merely linked to a car’s steering, the AFS controller controls the lighting direction independently and is combined with HID (High Intensity Discharge) headlights with an automatic levelling system for optimum night-time vision. Rain sensing windscreen wipers will be available and a timed spray windscreen wash system is fitted to ensure the best possible visibility in poor weather. This is further aided by the use of water-repellent glass, which is specially coated to maintain clear vision through the front side windows. Side protection is further enhanced by "Thorax-Abdomen-Pelvis" side airbags. This new type of airbag features a capacity of 13 litres, compared with 10 litres for the conventional side airbags. For this reason, it can reduce the risk of chest and abdomen injuries by spreading the forces over a wider area. Injuries to the legs, common in major frontal impacts are likely to be significantly reduced by the RX’s provision of a knee airbag for the driver, for the first time in the segment. The main purpose of knee airbag adoption is to reduce injury from contact with steering column and lower dashboard structures, but they have also been found to reduce head and chest injuries by reducing the pelvis displacement and rotation of the torso in a major impact. The overall structural strength of the new RX also plays a significant part in protecting its occupants. Over 80 cars were crash tested, achieving optimal results in impacts far greater than the mandatory crash test requirements.